Some of the flowers from my garden last summer - I'm so looking forward to more this summer! It was a very odd week - we started with Martin Luther King Jr Day on Monday and our daughter and I fighting a bad head cold, Missy was better Tuesday but I was not, and then I felt like we were trying to catch up all the rest of the week. I was a bit relieved that it was Friday today! We had several just unpleasant things going on this week but we did a very nice job of being fairly frugal - it's easy to not spend money when you're home sick, I guess. Either way, it ended up being a reasonable week all the way around and we're looking forward to a quiet week at home and some extra rest before all the activities start to ramp up next week. * We made two types of soup, biscuits, and waffles at home this week. * John brought home leftover chicken noodle soup (homemade) and cookies from a church event. We used those for lunch and treats. * I cleaned out my tea stash, composed a bit that were way past usable and sorted everything else so it is more accessible and usable. I also discovered that I have 5 tea strainers, so I put one in my bag to take up to work for my tea stash there. I had been just letting the leaves settle before drinking. This will be much better. * I worked on quite a bit of embroidery this week. All for gifts. * We renewed library books online last weekend. We'll return them this weekend and get a few new. * We ate all meals and snacks at home but one, which was lunch at church for Bible Study on Sunday. * We updated the budget book and paid the bills. The budget will be really quite tight the rest of the month - tighter than we'd like. But, we paid off a small medical debt and the car this month! I'm super excited about both! We still have several more medical bills to go, but we're making progress. I think that's it for us this week. What did you do this week that was frugal? I thank you for taking the time to comment and look forward to reading your thoughts! As always, please keep your content polite, relevant and mature. I reserve the right to delete comments that are rude, mean, vulger or otherwise inappropriate. I appreciate your understanding that is meant to be an uplifting blog where we can discuss things as adults rather than as opponants. We are cold, cold, cold here and we are expected to get colder. Our projected low temperature on Wednesday is in the -30's F (-35-ish C). I am so grateful for a warm house, warm clothes and vehicles with heating that works. Today (Saturday Jan 26) it is -3F (-20C) and snowing lightly outside. It looks very pretty out there. I will enjoy it through the window of my kitchen while working on a few things this morning. 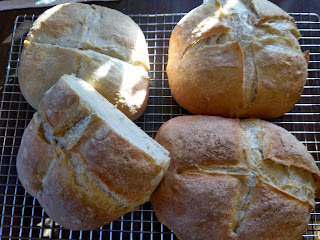 * Baked four loaves of French bread, two types of soup, and homemade pizza this week. * The children made two types of cookies and an Angel Food Cake this week for a bake sale fundraiser at church. * The children participated in a separate fundraiser for their class trip this spring. They will have another fundraiser each of the next two weeks. Our second "summer" event at the end of the summer here was to spend all day one day this last week at a friend's cabin. 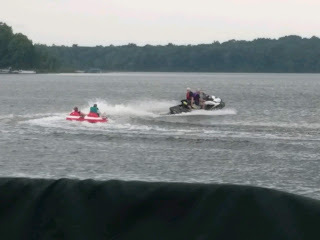 The above photo is the children on a float behind a personal water craft. They had a BLAST! Both want to return as soon as possible and do it again. That won't happen this fall but maybe next summer. John went on the water craft with our friend and they hit a wake and rolled - he was soaked but fine and we all laughed because it was like watching slow-motion! (No worries about the water craft - it shuts off if the driver falls off.) It was a great time and free other than gasoline to get there. We were there with two other sets of friends - lawn games, a bonfire, fishing and really good food. It was a wonderful end to the summer. I'm living vicariously through my parents - Gerbera Daisies are some of my favorite flowers and they do not grow well in Minnesota. We tend to be too cold - right now we are coming out of the Arctic Freeze and it is definitely too cold for flowers outdoors! My parents live in a the southern part of the US and had a very rare hard freeze this week. 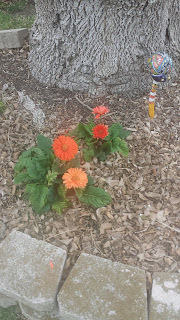 My Dad sent me this photo to show that their Gerbera Daisies survived! They thought they surely would not. Either way, they sure are pretty! !